Left Wing Bourbon performs at Blues on the Chippewa in Durand’s Memorial Park. Sounds like Summer Concert Series Every Thursday from Jun. 2 to Aug. 25, 6:30-8:30pm • Phoenix Park, 330 Riverfront Terrace, Eau Claire • FREE • The Sounds Like Summer Concert Series is Volume One’s Thursday night gig in downtown Eau Claire’s Phoenix Park. Local bands play to crowds each night on the banks of the Chippewa River in June, July, and August. Enjoy a pre-show set from area singer/songwriters at 6pm. Multiple food vendors will have food for sale. Pets are allowed at the concert. 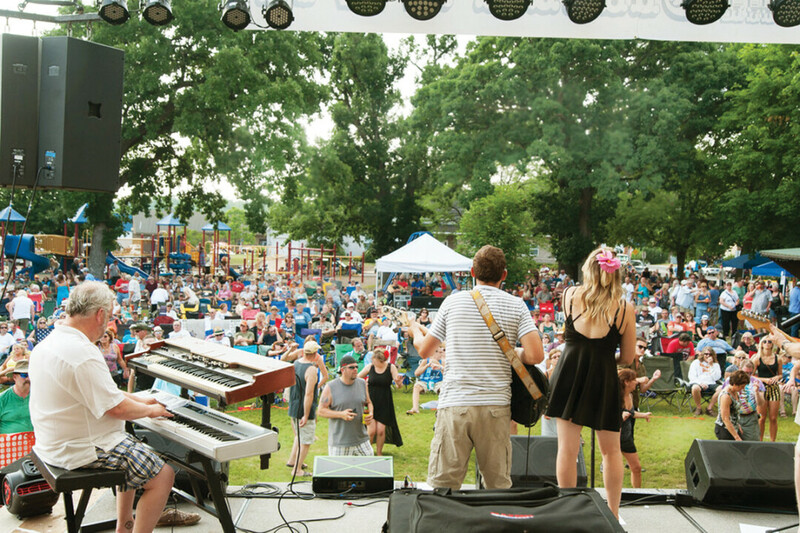 Chippewa Falls Music in the Park Every Sunday from Jun. 5 to Sep. 4, 1-3pm • Irvine Park, Bridgewater Avenue, Chippewa Falls • FREE • All Ages • (715) 723-0051 • chippewafalls-wi.gov A series of local music acts ranging from acoustic cover classics to rock ‘n’ roll bands running throughout the summer. Tuesday Night Blues Every Tuesday from May. 31 to Aug. 30, 6:30-8:30pm • Owen Park, 1st Ave. and Water St., Eau Claire • FREE • All Ages • Organized by the Chippewa Valley Blues Society, this family-friendly series invites talented local blues musicians to play weekly concerts. Eau Claire Municipal Band Every Wednesday from Jun. 8 to Jul. 27, 7:30-9pm • Sarge “Boyd” Bandshell, Owen Park, Eau Claire • FREE • All Ages • eauclairemunicipalband.org Listen to high quality, free entertainment by the oldest musical organization in Eau Claire. From traditional Sousa marches, patriotic melodies, pop, jazz, rock, and soundtracks, there is something for everyone’s listening pleasure. Summer Concert Sundays Jun. 12, 1:30-4pm; Jul. 17, 1:30-4pm; Jul. 31, 1:30-4pm; Aug. 28, 1:30-4pm; Sep. 11, 1:30-4pm • River Bend Vineyard & Winery, 10439 33rd Avenue, Chippewa Falls • (715) 720-9463 • riverbendvineyard.com Bring you friends and enjoy live entertainment from our patio or lawn, steps away from the vineyard and a world away from the everyday. Concerts are outside, so bring lawn-chairs and blankets as seating is limited. Altoona Music in the Park Every Sunday from Jun. 6 to Aug. 22, 5:30-7:30pm • 10th Street Park Pavillion, 10th Street, Altoona • FREE • All Ages • A series of local music acts ranging form acoustic cover classics to to rock ‘n’ roll bands running throughout the summer. Music Over Menomin Every Thursday from Jun. 16 to Aug. 11, 7pm • Menomonie Public Library, 600 Wolske Bay Rd, Menomonie • FREE • All Ages • (715) 232-2164 • menomonielibrary.org Bring your lawn chairs, picnic baskets, and blankets and enjoy free live music over Lake Menomin. Durand Music in the Park Jun. 22, 6-9pm; Jul. 27, 6-9pm; Aug. 24, 6-9pm • Memorial Park, 1st Avenue and Madison Street, Durand • FREE • All Ages • Live music at Durand’s Memorial Park Bandshell. TC Cats in June, Biesterveld in July, and the Whitesidewalls in August. Food vendors at each concert, and a special “Taste of Durand” event during the August concert. Ludington Guard Band Tuesdays Jun-Aug., 8pm • Wilson Park band shell, Menomonie • ludingtonguardband.org A community concert band that was officially organized in 1888 with roots going back to 1877. They play a variety of classical band music, marches, overtures, show tunes and novelty pieces. Schultz’s Country Barn Summer Music Series Tuesdays starting June 14, 6-8:30pm • Schultz’s Country Barn, 50996 Main St. Eleva • (715) 287-4684 Performances by James Ignacio, Poppa Bear Norton, Ray Rubenzer, and more. Check out the full schedule at www.schultzscountrybarn.com. Dove Healthcare Outdoor Summer Concert Series 6-7:30pm, Wednesdays, Jul. 6 - 27 • Dove Healthcare, South 3656 Mall Drive • dovehealthcare-southeauclaire.com Bring a lawn chair for night of food, fun, and music in the courtyard. Held rain or shine. All local musicians. Featured musicians include: ClearWater Connection, Sir Arthur's Court-Tet, Two Frets Up, River City Ramblers, and more. Hoots & Happenings at The Fish Farm Every Sunday until Sep. 25, 1:30-4:30pm; • Bullfrog’s Eat My Fish Farm, N1321 566th Street, Menomonie • FREE • All Ages • (715) 664-8775 • eatmyfish.com Catch some local music at the side of the pond, Sunday afternoons at the Fish Farm during their annual Hoots & Happenings Season. Local favorites will play while you drop your lures and eat some Hobo Shorelunches. PARKBEATS Monday nights, 6:30pm starting June 27 • Central Park, Osseo • www.theheartbeat.us This weekly outdoor summer series held in beautiful Central Park in Osseo presented by The Heartbeat Center for Writing, Literacy, and the Arts. Driftless Music Festival 2016 Jun. 9, 1pm • Eckhart Park Viroqua WI, Decker St Next to Vernon Co Courthouse, Viroqua • FREE • driftlessmusicfestival.com Professional, eclectic music. Food and beverage available. visit online for more info. Blue Ox Music Festival 2016 Jun. 9, 5:30pm; Jun. 10, 11:30am; Jun. 11, 11:30am • Blue Ox Music Festival Grounds, 5024 Crescent Ave., Eau Claire • $150 for 3-day general admission (includes basic camping and parking), $335 for 40’ of electric camping • blueoxmusicfestival.com/info/ A three-day outdoor music festival celebrating the best of bluegrass, roots, and Americana music. Thursday’s lineup: Leftover Salmon, Horseshoes & Hand Grenades, The Big Wu, and The Cactus Blossoms. Friday’s lineup: Sierra Hull, Charlie Parr, Head for the Hills, Blitzen Trapper, The Wood Brothers, Sam Bush, Pert Near Sandstone, and Greensky Bluegrass. Saturday’s lineup: Whiskey Shivers, Jeff Austin Band, Nikki Lane, Shovels & Rope, The Del McCoury Band Feat. Very Special Guests, Pert Near Sandstone, and Railroad Earth. Go online for camping information and full music schedule. Country Fest 2016 Jun. 16, 3pm; Jun. 17, 11am; Jun. 18, 11am; Jun. 19, 12:30pm • Country Fest Grounds, 24447 County Highway S, Cadott • View ticket information online • (800) 326-3378 • countryfest.com Four day long country musical experience in Cadott. Multiple stages and performance venues around the grounds. Pre-show on wednesday for 4-day ticket holders. Thursday: Dylan Jakobsen, Caroline Kole, Neal McCoy, Randy Houser, and Dierks Bentley. Friday: Chris Hawkey, Adley Stump, Drew Baldridge, Old Dominion, Maddie & Tae, Jerrod Niemann, and Kenny Chesney. Saturday: Jake Worthington, Shelly Fairchild, Brooke Eden, Jana Kramer, Frankie Ballard, Kip Moore, and Carrie Underwood. Sunday: Elizabeth Lyons, Abi Ann, Mo Pitney, Phil Vassar, Chase Rice, and Sam Hunt. Rock Fest 2016 Jul. 14; Jul. 15; Jul. 16 • Rock Fest Grounds, 24447 County Hwy S, Cadott • See website for ticket packages and prices • rock-fest.com A massive rock n’ roll festival featuring national and international performers. There will be tons of performances and exhibitions at various other stages and venues of the park. Thursday’s main stage lineup includes: Art of Dying, Red Sun Rising, Nothing More, Hollywood Undead, Skillet, Marilyn Manson, and the Hollywood Vampires. Friday’s main stage lineup includes: Wayland, Escape the Fate, Adelitas Way, Saint Asonia, Rise Against, Breaking Benjamin, Alice in Chains. Saturday’s main stage lineup includes: Bridge to Grace, Wilson, Atreyu, In This Moment, Bullet for my Valentine, Five Finger Punch, Slipknot. Country Jam 2016 Jul. 21, 2-11pm; Jul. 22, 2-11pm; Jul. 23, 2-11pm • Country Jam Grounds, 3443 Crescent Ave., Eau Claire • $165 three day admission, $115 three day student/military admission, $105 one day general admission, plus reserved seating, VIP experience, ultimate VIP, party pit, and skybox tickets also available • (715) 839-7500 • countryjamwi.com Country Jam USA is the outdoor music festival that you won’t want to miss this summer. It’s a weekend full of friends, fun, and the best live country music. Big stars, big hits, big fun. Thursday performers include Jackson Michelson, The Cadillac Three, Colt Ford, Cole Swindell, and Florida Georgia Line. Friday performers include Clare Dunn, Locash, Eli Young Band, The Band Perry, and Jake Owen. Saturday performers include Sasha McVeigh, Brothers Osborne, A Thousand Horses, Thomas Rhett, and Jason Aldean. Blues on the Chippewa Aug. 5; Aug. 6; Aug. 7 • Memorial Park, Downtown Durand • FREE • bluesonthechippewa.com Numerous musicians and music lovers from all over the country gather in Durand for the blues. Also featuring a craft show and classic car/motorcycle show. Summer Set Music & Camping Festival Aug. 12; Aug. 13; Aug. 14 • , Somerset • See contact info for cost • summersetfestival.com Summer Set Music & Camping Festival is the ultimate Summer experience. A celebration of everything we love about Summer, featuring a unique blend of artists on multiple stages in an incredible northern Wisconsin setting. Eaux Claires Music & Arts Festival 2016 Aug. 12; Aug. 13 • Country Jam Grounds, Crescent Ave., Eau Claire • Two-day GA passes are $169; camping passes sold separately and start at $165 • eauxclaires.com The Eaux Claires Music & Arts Festival is a two-day arts festival at Foster Farm that is curated by Justin Vernon of Bon Iver and Aaron Dessner of The National. The 2016 lineup includes Bon Iver, Erykah Badu, James Blake, Beach House, Nathaniel Rateliff & the Night Sweats, Mavis Staples, Bruce Hornsby and the Noisemakers, and an all-star tribute to the Grateful Dead called Day Of The Dead. Northwoods Rock Rally 2016 Aug. 18; Aug. 19; Aug. 20 • Northwoods Rock Rally Grounds, W4335 Town Line Rd, Glen Flora • $69 for 3 days, $40 for one day, $75 for a campsite, • 18+ • 1-888-831-7625 • northwoodsrockrally.com/index.htm 3 days of live music, beer, vendors, camping, games & contests, and much more. Lineup includes Paint Dry, Divided Highway, Drowning Pool, STARSET, Arch Allies, Hinder, Molly Hatchet, Texas Hippie Coalition, and more. Buckle in for 3 crazy days. Nate Plummer in Concert: A Benefit for Bryan Joas Jun. 2, 7-8:45pm • The Heyde Center for the Arts, 3 South High St., Chippewa Falls • $10 adults, $9 seniors, $6 youth • All Ages • (715) 726-9000 • cvca.net A New York City based actor and voice teacher originally from Chippewa Falls, Nate Plummer will return to the area to perform a benefit concert for Bryan Joas, who was in a hit and run bike accident. Proceeds from the benefit concert will go to supporting Bryan and his family. Resonant Rogues, Lost Dog Street Band, & The Show Tuners Jun. 12, 7-9pm • Mabel Tainter Center for the Arts, 205 Main St. E, Menomonie • $15 • All Ages • (715) 235-0001 • mabeltainter.org Asheville, NC based band The Resonant Rogues are the songwriting soul child of partners Sparrow and Keith J. Smith. Lost Dog Street Band is a trio from Tennessee. Together they have traveled the country wide, at first bringing music with them on foot. The Show Tuners are a Chippewa Valley based group of incredibly talented young people who arrange, sing, and perform all show tunes acapella music. The Winery Dogs Jun. 28, 7:30-8pm • The State Theatre, 316 Eau Claire St., Eau Claire • $32-$42 • (715) 832-2787 • eauclairearts.com It would be easy to call The Winery Dogs a supergroup and the proof is in the brew. The Winery Dogs is an eclectic, fully realized group with songs that groove and swing without sacrificing any of the grit that makes great hard rock so inspiring. Kids from Wisconsin Jul. 9, 7pm • Eau Claire Regional Arts Center, 316 Eau Claire St., Eau Claire • $10 student, $15 adult • All Ages • (715) 832-2787 • EauClaireArts.com The Kids from Wisconsin performs a diverse repertoire of morale-boosting musical entertainment for audiences of all ages. Plays a broad repertoire of music that includes the American favorites, big band, 50’s- 80’s classics, Motown, country, Broadway and current top hits, filling a two hour fully staged performance. The Tallest Man on Earth Jul. 16, 7:30pm • The State Theatre, 316 Eau Claire St., Eau Claire • $30 advance, $32 at the door • (715) 832-2787 • eauclairearts.com Features Eau Claire natives guitarist Mike Noyce (Bon Iver), pianist/pedal-steel player Ben Lester (S. Carey) and drummer Zach Hanson. On their Dark Bird Tour, they’ll play from their latest album recorded in Justin Vernon’s April Base Studios in Fall Creek, WI. Expect the loudest and proudest sounds yet, but also the softest and the lowest. For first time The Man is bringing a band to the stage with him.